Today was the last day of school for my oldest before winter break. My younger son spent the day unhappy that his brother was having a party at school and believing that our new puppy was getting more attention than him. I have a feeling it is going to be a long break. Due to last minute changes I will be hosting Christmas this year so tomorrow is going to be spent cleaning and prepping. I am planning on keeping things low key, so it should be an easy holiday. I hope. As I seem always be since having kids I will be spending the weekend getting last minute gifts that I fully intended to buy weeks ago and time just got away from me. And wrapping. My mother was a beautiful gift wrapper. She would buy fabric and make handmade bows. They really were works of art. I seem to have inherited none of this gift. When I was younger I worked in the executive office of a dept store and had to fill in at the gift wrapping counter during the holiday rush. I was horrible at it and was told to help costumers, not to wrap. That was when I decided that I was destined to be someone that is great at picking out the perfect bag, no wrapping involved. So wish me luck with my gift wrapping this weekend. This week's meal have been mostly stews and soups, since it has been cold and rainy. I have really not been in the mood for much else with the end of my cold still sticking around. Last night I tried a new recipe for Black Bean Soup from the December issue of All You magazine, which with 3 grams of fat and 12 grams of protein looked like a great pre-holiday meal. This recipe has 8 ingredients. It takes 1 hour 45 minutes of cooking time, 10 minutes of prep and makes 4 servings. I had no problems finding any of the ingredients at my local grocery store. Instead of quick cooking the beans, I soaked the black beans overnight. I find this method much easier and requires less effort. I let the beans cook for longer than the hour and a half suggested, probably closer to two full hours. Adding the citrus juice at the end of the cooking time really does add to the dish and I definitely suggest adding the step. I did not add sour cream to my serving, but I did to my boys. I followed the remainder of the recipe as written. With only 217 calories and 3 grams of fat per serving this recipe is a great healthy meal option. It is especially great given that next week is Christmas and I will inevitably be overeating, so something light and filling this week is essential. My two boys were skeptical until they ate their servings and then loved it. My husband's only complaint was that he would have preferred not to have the tomato chunks, but he never likes chunks of tomatoes in recipes. For the recipe go to Black Bean Soup. Thanks :) Followed you back! Thanks :) It's really easy too! Love black beans this looks so healthy and delicious. I love them also, they are a great way to get more fiber and protein into your diet! Thanks for sharing this on foodie friday and Merry Christmas. Yum, this is my favorite soup!! Love it in a bread bowl. Thanks for sharing at Foodtastic Friday! Sounds delicious! I love quick and easy recipes. :) Stopping by for the Sparkle & Shine blog hop. I love quick and easy recipes also, especially during the week! 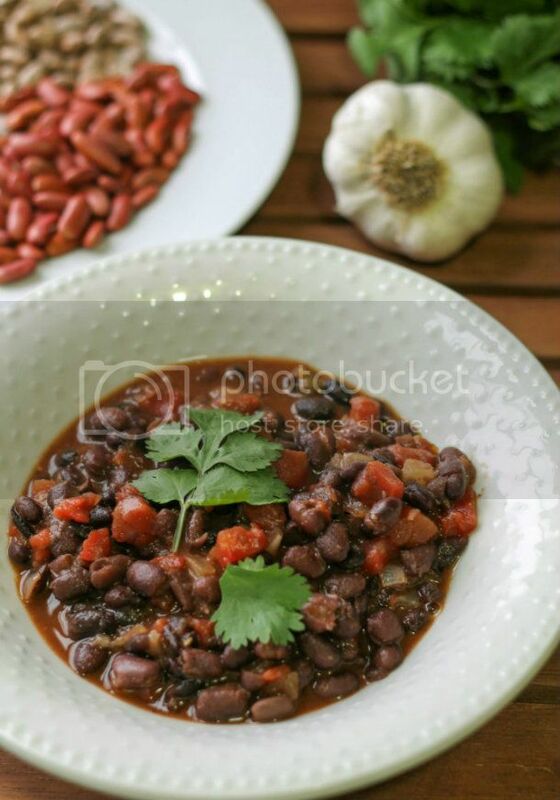 I love black beans also :) I have a huge stack of recipes that I always pull out, some I make and some get lost in the very large and growing pile! If you end up trying the recipe tell me how it goes! I love black bean soup. This was a great read! Thank you for joining my blog hop!